The Melbourne Anarchist Communist Group supports the struggles of refugees, who are simply demanding their legal rights to asylum. We call on the union movement in Australia, sections of which have quite reasonable refugee policies, to act on them and come to the refugees’ defence. We look forward to a workers’ revolution which will create a single federal world community with freedom of movement for everyone. And in the meantime, we support the work of the Close the Camps Action Collective: https://www.facebook.com/Close-the-Camps-Action-Collective-1741130979474102/ (Warning Facebook link). Late last year, the Manus Island Detention Centre was closed. Nominally run by the Papua New Guinea Government, it was in reality operated by the Australian Government using remote control. Inconveniently, in April 2016 the PNG Supreme Court found that the centre violated the PNG Constitution by imprisoning almost 900 people who had not committed any crime. Instead of releasing the refugees imprisoned there, the governments conspired to keep them locked up while taking their time coming up with alternative arrangements. 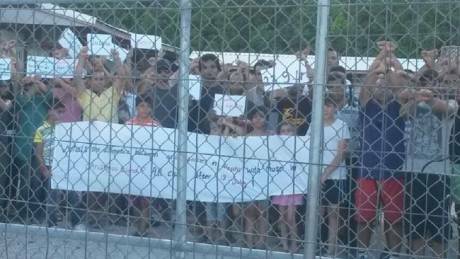 The Manus refugees have been protesting their treatment for years. In the run-up to the closure, they escalated their protests greatly, getting wide publicity in Australia via social media and then breaking into the mass media. The new accommodation is located in the town, rather than on the isolated naval base that housed the Detention Centre, and the PNG citizens on Manus are deeply divided over the refugees. Some are very hostile and have issued threats. As the closure deadline approached and centre management became more desperate, the vast majority of refugees refused to move. They maintained their non-violent stance in the face of escalating violence from the PNG police and military, directed by the PNG Government, and the security guards at the centre, ultimately directed by the Australian Government. Their struggle sparked widespread sympathy and a series of demonstrations by the refugee support movement in Australia. The Government was at last paying a small price for its policy of systematic cruelty. In late November, a brutal police assault succeeded in removing the 600 remaining protestors. While protests have since died down, news continues to trickle out. The centre was closed while much of the new accommodation was still under construction and uninhabitable. While technically the refugees are not “detained” there (they can come and go), their lives are still highly regulated and closure has been a pretext for cutting back and removing services. Fears about the hostile reception awaiting the refugees in the township have been validated, while conditions in the new accommodation are poor. One block even has raw sewage running down the street – just the thing to make the neighbours happy! The torture of the refugees on Manus and the similar torture visited on the refugees on Nauru are things that the Australian Government would like everyone to forget. Triumphant rhetoric about “Sovereign Borders” is a little harder to maintain when the struggles of refugees force the human cost of those policies into public view. A Fortress Australia policy necessarily means racist violence against those the policy seeks to exclude and the treatment of refugees on Manus and Nauru amounts to torture on a grand scale. Both major parties in Australia stand condemned over this. The Melbourne Anarchist Communist Group supports the struggles of refugees, who are simply demanding their legal rights to asylum. We call on the union movement in Australia, sections of which have quite reasonable refugee policies, to act on them and come to the refugees’ defence. We look forward to a workers’ revolution which will create a single federal world community with freedom of movement for everyone. And in the meantime, we support the work of the Close the Camps Action Collective: https://www.facebook.com/Close-the-Camps-Action-Collect…4102/ (Warning Facebook link).